Burton Poker Club was found to provide poker players with profound and detailed information on poker as well as to conduct poker tournaments for players of different skill level. Each month we hold poker tournaments at Burton where poker fans have fun, commu­nicate and win good money. If you want to become a part of our community, please write to chris@poker-teacher.net. In all the games, there’re special events or so called competitions, where the best players are determined. Poker isn’t the exclusion, there’s a whole bunch of different poker tournaments held in different parts of the world – (USA, Argentina, Spain, Great Britain, Monte Carlo, Macau, New Zeland, South Korea, Australia, etc). The winners of these tournaments are declared to be the best of the best poker players. But of course, the honorable title world champion of the Poker can be earned only if you attend the World Series of Poker tournament, which is held annually in Las Vegas. In order to enter big events, the participants have to pay the buy-in, which depends on the level of the tournament. For example, if you want to apply for participation in the World Series of Poker event you will have to pay really big sum of money. Mix-Max – is a relatively invention. The main idea is that the sizes of the tables at the every stage of the tournament are different, it’s a mix of the knock-out and shootout formats. Fixed limit – this means that participants can raise their bets only to a certain extent, but the good news is that when closer to the final this amount can be increased. 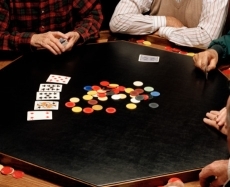 Semi-structure betting - this means, that if the first player raised the bet on 10 dollars, the next player can only raise the bet on the same amount of money. Unstructured betting - when blind bets are fixed, the players can bet as much as they actually want. Among the major poker tournaments there’re - World Series of Poker and World Poker Tour, World Series of Poker Europe, European Poker Tour, Latin American Poker Tour, Asia Pacific Poker Tour, Crown Australian Poker Championship and Crown Melbourne. All tournaments fall under the two main categories - open and invitational. It should be pointed out that the World Series of Poker (which is considered to be the most prestigious poker event, where one can even get the title of the World Poker Champion) is an open tournament. And of course, there’re many tournaments, which are held online, so if you want to participate in one of them, you should just make a quick search, and the reviews on the different online casinos, in order to find out where you can play safely and enjoy the game. Note: this copyrighted content can't be copied and spread without the special permission.